This January, we have just your cup of tea! Grab your coats and warm up with a cup that’s fun for the whole family. To get in on what’s piping hot for National Tea Month, check out these local spots. Book a trip back in time to the charming Miss Hickory’s Tea Room. Housed in a 1830s farmhouse with hostesses dressed in early 1900s attire, Miss Hickory’s will fill the family with a sense of fantasy and excitement. Visit the Storybook Tea Room after lunch to share a tale while sipping a hot cup of tea. Winter blues got you down? 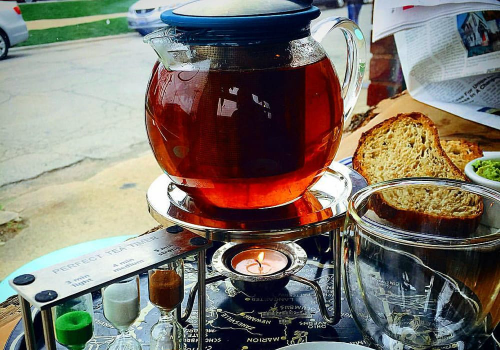 Adventure to Hingetown for a one-of-a-kind experience at this organic tea café. Enjoy a personal pot of tea brought to you with a perfect tea timer to reach your desired strength. Kids and adults alike will love watching the tea steep. On the way out, grab a bag of loose tea to take home and enjoy later. For fancy afternoon tea, look no further than Canfield. Relax and enjoy the Victorian era décor while your kids take advantage of the dress up area! Piccadilly offers a wide variety of sandwiches and desserts that will leave everyone feeling satisfied. Tip: Try the homemade scones and orange tea bread, two Yelper favorites! For picky tea drinkers, take time to explore and scent more than 130 different varieties of teas or tisanes at The Tea Lab. The staff will carefully assist you in making selections if you’re worried about allergies. The atmosphere of this modern tea store gives off major scientist vibes! Host the perfect afternoon tea party the whole family will enjoy! Furniture, dishes, and a tea service of the Victorian era mix traditional with modern, and antique high chairs are available upon request. Quintealia’s also offers menu options for those with heartier appetites. Are you celebrating a birthday? Expect a tiara to mark the occasion! This is the perfect spot for anyone seeking vegan and vegetarian food options. Greenbridge Teahouse and Cafe is a unique venue offering organic and fair trade teas from around the world. You can choose your own teacup from a selection of vintage china for an individualized experience. The only catch? They’re on winter break through February 6. Mark your calendar! For more great tea spots, check out the National Tea Month bookmark collection. Yelp is a website and mobile app that that connects people with great local businesses – anything from restaurants, parks and spas to dog groomers, mechanics, even dentists! Start exploring your neck of the woods. Northeast Ohio Parent proudly hosts content from our partner Yelp Cleveland. These posts aim to connect the parents and families of the city to fantastic local businesses. Stay tuned for more fun guides from Yelp Senior Community Manager Lauren Kotmel and Yelpterns Madison Simpkins and Rose Dolan.